Is this on your radar? For a device that is about $375, it doesn't seem that bad. If you need something inexpensive to get you by for a bit, this might be one to look at. Considering what they could get out of a phone that's roughly half that price (5X), I expect that this is going to be an excellent phone. Good point. I would expect the 8 to at least hold it's own against the 5X. Looking to retire my Note 3 and the Honor 8 has caught my eye, especially after seeing the Note 7's price! Looking forward to more coverage. Hearing about the specs and that blue, it really is now. All of the hands on I have read look promising. I'm interested. Looks interesting. Will be interesting to see how they are with updates and if more devices with their Kirin chip make it to the US. Good points. I honestly would like to see the phone and the UI first hand. Best way to do that is to get the device, and at least it doesn't break the bank. People who register get $50 off the price. Not bad...I signed up because why not? I really liked the 5x when it was released, but I held off due to the slower processor. I might get this one, $350 really isn't bad. I really wish we could count on frequent updates... That's really the only thing pushing me towards a new Nexus over this or a oneplus 3. Been a great year for phones in the $400 range, just need that Nexus announcement! Guytronic, Premium1, Golfdriver97 and 1 others like this. Based on my experience with a recently purchased h5X the h8 will be my next phone. I may be one of those "rose colored glass types" yet the feel and performance of the 5x is right on. The feature that sealed it for me with the 5X is the fingerprint scanner\button. I'm not really the latest greatest flagship kind of user so doing with less for a lot less money works. Best Buy is also offering a $50 gift card if you preorder. libra89, Guytronic and samix like this. Black and white are on the site as well. I would go with BestBuy for the blue if I had to have it. B&H is where I'll order from since they give the $50.00 gift card with purchase. With B&H there's no tax for me and I think shipping will be free. You and me are on the same wavelength right now. No tax + very fast shipping (I live in a state that only takes 1 day for shipping from them so I'm very spoiled) + free shipping = win. Shipping is normally free with them, and also 30 day returns! 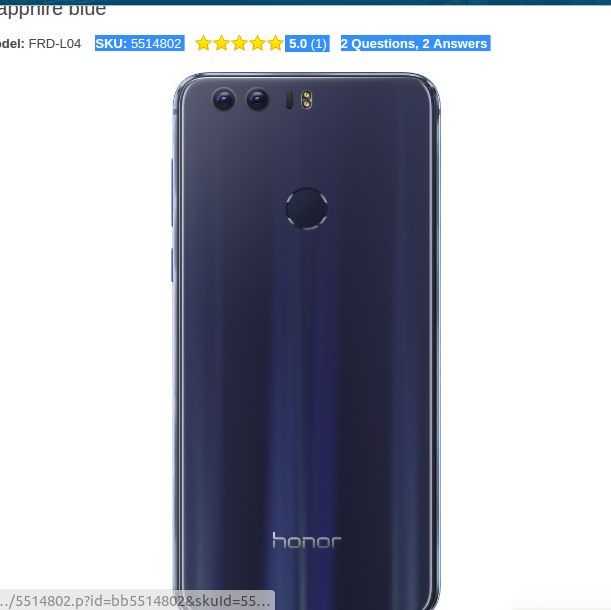 Honor has a 15 day return window. I like the 30 day return window that they offer a lot. Being the indecisive person I can be, that window gives me room to fully make up my mind. Tax for me is about 30 bucks. B&H is the best option. I emailed them to see if I can kick in the gift card for a price drop. Almost 2 years in my opinion. The mid price point is a hot area for OEMs. libra89, samix and Guytronic like this. libra89 and Golfdriver97 like this. Guytronic and Golfdriver97 like this. Definitely an option if I switch from Verizon.